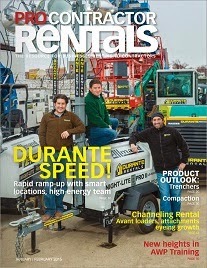 NEW YORK, February 5th, 2015 – Durante Rentals is featured in the current January/February issue of Pro Contractor Rentals, a magazine catering to businesses renting construction equipment to general contractors. Along with the cover shot, showcasing the three partners at their main Flushing, NY headquarters, the latest issue includes seven pages of in-depth coverage focusing on Durante Rentals’ overall keys to success. The article offers insight into what makes Durante Rentals one of the fastest-growing privately owned companies in America and discusses “Durante Speed”, an internal pace that is frenetic, not just day-to-day, but in terms of expansion as well. They credit their high-energy team of employees for their “white knuckle” growth rate. “We work on the core of our employees and invest a great deal of energy and emotion into them as people. In fact, our sales growth is a barometer measuring the success our people bring to the company” says CEO Anthony Durante. The article continues to discuss their aggressive-conservatism management style and touches on their core values of speed, convenience and culture. These core values, instituted the day their doors first opened, have been a major contributing factor to their white-hot three year growth rate of 211%. Durante Rentals was named to the Inc. 5000 list of America’s fastest-growing companies in 2013 and 2014, coming in at #1879 and #2098 respectively. The article also talks about on the early days at Durante, including their grand opening during the recession of 2009, their marathon round-the-clock annual meeting sessions and their ongoing focus on improvement, in all areas of the company. The article in its entirety is available to magazine subscribers and can also be viewed here for those that do not currently have a subscription. Founded in 2009 by three entrepreneurs, Durante Rentals is the most trusted name in construction equipment and tool rentals in the NY tri-state area. With the core values of Speed, Convenience and Culture, general contractors look to Durante for all their equipment needs including excavators, skid steers, light towers, generators, compressors, forklifts, air tools, boom lifts and more. With four convenient locations and counting, their geographic footprint continues to expand while servicing all five boroughs of NYC, Westchester, Rockland County, Connecticut and New Jersey. For more information about Durante Rentals, visit www.DuranteRentals.com. Pro Contractor Rentals provides information of value to rental centers who focus time, resources and attention on meeting the demands of contractor customers. The magazine is published by the folks at Direct Business Media, LLC, publishers of Contractor Supply magazine, Industrial Supply magazine, IDC Industrial Review, the STAFDA Membership Directory and the ISA Membership Directory. For more information, visit them at www.procontractorrentals.com. Great information,that Pro Contractor Rentals serves a niche audience of independent rental centers and dealers/distributors that have a wide variety of rental equipment and tools used by professional contractors.